A bridge replaces missing teeth with artificial teeth, looks great, and literally bridges the gap where one or more teeth may have been. Your bridge can be made from gold, alloys, porcelain, or a combination of these materials, and is cemented to the teeth on either side. The success of any bridge depends on its foundation — the other teeth, gums, or bone to which it is attached. Therefore, it's very important to keep your existing teeth, gums, and jaw healthy and strong. 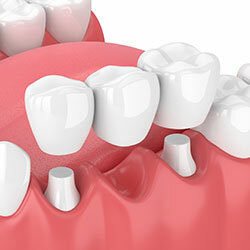 If you are missing a tooth or teeth we would be happy to talk to you about a bridge.